Dmitrii Mendeleev (1834-1907; see portrait of Mendeleev in 1878 by Kramskoy) was born in Tobolsk, in Western Siberia. His chief contribution to chemistry was the establishment of the periodic system of elements. Mendeleev was one of a number of independent discoverers of the periodic law in the 1860s--that number ranging from one [Leicester 1948] to six [van Spronsen 1969] depending on the criteria one adopts. Mendeleev's formulation was clearly superior in several respects to the work of contemporary classifiers: it was the clearest, most consistent, and most systematic formulation, and Mendeleev made several testable predictions based on it. It was not, however, free from error. Scientists, even great scientists, trying to see further than others have in the past, do not always see the whole picture clearly. As noted below, Mendeleev himself corrected some of the errors within a few years; others persisted well into the 20th century. 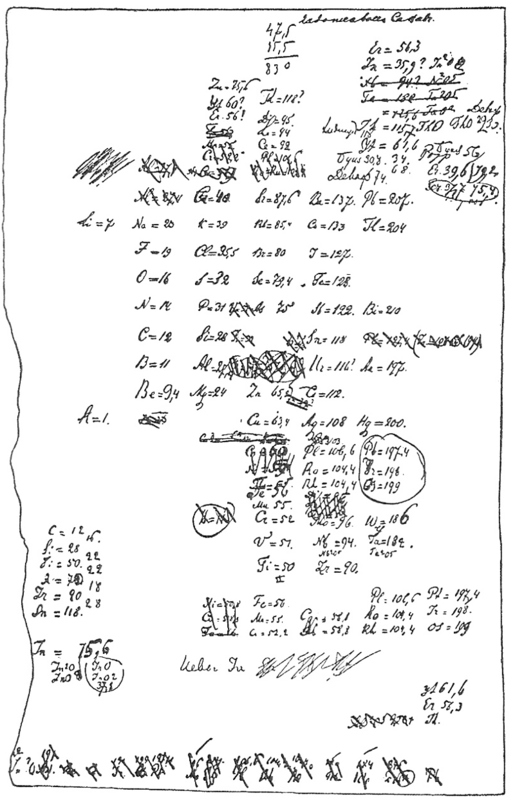 This table and the accompanying observations were first presented to the Russian Chemical Society in March 1869. (Actually, Mendeleev was ill, and his colleague Nikolai Menshutkin presented his paper [Menschutkin 1934].) The paper was published in the first volume of the new society's journal. That same year, a German abstract of the paper, consisting of the table and eight comments, was published in Zeitschrift für Chemie. The German abstract was the vehicle by which Mendeleev's ideas reached chemists working in Western Europe. An English translation of that German abstract is presented here. View a manuscript draft of the table. By ordering the elements according to increasing atomic weight in vertical rows so that the horizontal rows contain analogous elements, still ordered by increasing atomic weight, one obtains the following arrangement, from which a few general conclusions may be derived. B=11 Al=27,4 ?=68 Ur=116 Au=197? N=14 P=31 As=75 Sb=122 Bi=210? The elements, if arranged according to their atomic weights, exhibit an evident stepwise variation of properties. Chemically analogous elements have either similar atomic weights (Pt, Ir, Os), or weights which increase by equal increments (K, Rb, Cs). The arrangement according to atomic weight corresponds to the valence of the element and to a certain extent the difference in chemical behavior, for example Li, Be, B, C, N, O, F.
The elements distributed most widely in nature have small atomic weights, and all such elements are marked by the distinctness of their behavior. They are, therefore, the representative elements; and so the lightest element H is rightly chosen as the most representative. The magnitude of the atomic weight determines the properties of the element. Therefore, in the study of compounds, not only the quantities and properties of the elements and their reciprocal behavior is to be taken into consideration, but also the atomic weight of the elements. Thus the compounds of S and Tl [sic--Te was intended], Cl and J, display not only analogies, but also striking differences. One can predict the discovery of many new elements, for example analogues of Si and Al with atomic weights of 65-75. A few atomic weights will probably require correction; for example Te cannot have the atomic weight 128, but rather 123-126. From the above table, some new analogies between elements are revealed. Thus Bo (?) [sic--apparently Ur was intended] appears as an analogue of Bo and Al, as is well known to have been long established experimentally. The principle of periodicity is apparent in this first sentence: repetition of chemical properties in a series of elements arranged by atomic weight. Note also the cosmetic difference between Mendeleev's layout and that of modern tables, which order the elements in horizontal rows such that families of elements appear in vertical columns. Mendeleev would use the latter sort of layout before long [Mendeleev 1871]. This table contains several implicit predictions of unknown elements. Mendeleev soon retreated from this prediction of a heavier analogue of titanium and zirconium. His later tables [Mendeleev 1871] erroneously placed lanthanum in this spot. This original prediction was actually borne out in 1923 with the discovery of hafnium. Rhodium (Rh) is misplaced. It belongs between ruthenium (Ru) and palladium (Pd). Technetium (Tc), the element which belongs between ruthenium and molybdenum (Mo) has no stable isotopes and was not synthesized until 1937. Most of the elements in this column are slightly out of order. After tungsten (W) should come rhenium (Re), which was not yet discovered, followed by osmium (Os), iridium (Ir), platinum (Pt), gold (Au), mercury (Hg), thallium (Tl), lead (Pb), and bismuth (Bi). Bismuth, however, is placed correctly insofar as it completes the row beginning with nitrogen (N). At this time, lead was frequently miscategorized, placed among elements which form compounds with one atom of oxygen (PbO analogous to CaO, for example); however, lead also forms a compound with two atoms of oxygen (PbO2 analogous to CO2) and it belongs in the same group as carbon (C). Similarly, thallium was often placed among elements which form compounds with one atom of chlorine (TlCl analogous to NaCl, for example); however, thallium also forms a compound with three atoms of chlorine (TlCl3 analogous to BCl3) and it belongs in the same group as boron (B). The classification of hydrogen has been an issue throughout the history of periodic systems. Some tables place hydrogen with the alkali metals (lithium, sodium, etc. ), some with the halogens (fluorine, chlorine, etc. ), some with both, and some in a box of its own detached from the main body of the table. Mendeleev's original table did none of the above, placing it in the same row as copper, silver, and mercury. Uranium (standard symbol U) is misplaced. Its atomic weight is actually more than double the value given here. The element which belongs between cadmium (Cd) and tin (Sn) is indium (In), and Mendeleev put indium there in the next version of his table [Mendeleev 1871]. The proper place for uranium, however, would not be found until the 1940s. In German publications, J is frequently used instead of I as the chemical symbol for iodine (Jod, in German). Iodine is placed correctly after tellurium (i.e., with the halogens) despite having a lower atomic weight than tellurium. See comment 7 after the table. The prediction of an unknown element following calcium is a weak version of Mendeleev's subsequent prediction of the element we now know as scandium, discovered in 1879 [Nilson 1879]. In Mendeleev's 1871 table [Mendeleev 1871] the missing element is correctly placed between calcium and titanium, and as an analogue of yttrium. That the 1869 prediction is flawed can be seen from the fact that every other entry in the bottom reaches of the table is wrong. (See next note.) Still, the prediction deserves more credit than van Spronsen gave it [van Spronsen 1969, p. 220]: "That the element next to calcium later proved to be scandium, was fortuitous; Mendeleev cannot be said to have already foreseen this element in 1869." The elements placed in the last four rows of the table puzzled Mendeleev, as is apparent from the glut of question marks and the fact that several are out of order according to their assigned atomic weights. Many of these elements were rare and poorly characterized at the time. Didymium appeared in many lists of elements at this time, but it was later proved to consist of two elements, praseodymium and neodymium. The atomic weights of erbium, yttrium (standard symbol Y), indium, cerium, lanthanum, and thorium are wrong. The interdependence of atomic weights and chemical formulas that plagued determinations of atomic weight since the time of Dalton was still problematic for these elements. Most of them elements (erbium, yttrium, cerium, lanthanum, and the component elements of didymium) belong to the family of rare earths, a group whose classification would present problems for many years to come. (Thorium belongs to the group of elements immediately below most of the rare earths.) Many of the rare earths were not yet discovered, and (as already noted) the atomic weights of the known elements were not well determined. The chemical properties of the rare earths are so similar that they were difficult to distinguish and to separate. Mendeleev made some progress with these elements in the next couple of years. His 1871 table [Mendeleev 1871] has correct weights for yttrium, indium, cerium, and thorium, and correct classification for yttrium and indium. Groups of similar elements with consecutive atomic weights are a little-emphasized part of classification systems from Mendeleev's time and before (cf. Newlands 1864) to the present. The existence of a very regular progression in atomic weight among elements with similar chemical behavior had attracted the attention of chemists almost from the time they began to measure atomic weights [Döbereiner 1829]. The triad of elements Mendeleev cites here includes two (rubidium and cesium) discovered in the early 1860s. Mendeleev's table, however, goes beyond strictly regular isolated triads of elements to a systematic classification (albeit not always correct) of all known elements. The valence of an element is essentially the number of bonds that element can make when it forms compounds with other elements. An atom of hydrogen, for example, can make just one bond, so its valence is one; we call it monovalent. An atom of oxygen can bond with two atoms of hydrogen, so its valence is two. Some elements, particularly heavier elements, have more than one characteristic valence. (For example, lead has valence 2 and 4; thallium has valence 1 and 3. See note 4 above.) The elements in the cited series have valences 1, 2, 3, 4, 3, 2, and 1 respectively. Mendeleev is correct in this observation. The two lightest elements, hydrogen and helium (the latter as yet unknown) are the most common elements in the universe, making up the bulk of stars. Oxygen and silicon are the most common elements in the earth's crust. Iron is the heaviest element among the most abundant elements in the stars and the earth's crust. Although the chemical behavior of elements in the same family is similar, it is not identical: there are differences due to the difference in atomic weight. For example, both chlorine and iodine form compounds with one atom of hydrogen: HCl and HI. These compounds are similar, in that they are both corrosive gases which dissolve readily in water. But they differ in that HI has, for example, a higher boiling point and melting point than HCl (typical of the heavier of a pair of related compounds). In later publications [Mendeleev 1871] Mendeleev went into considerable detail regarding the properties of predicted elements. The success of these predictions played a part in establishing the periodic system, although apparently not the primary part. [Brush 1996] See Scerri & Worrall 2001 for a discussion of prediction and accommodation in the periodic table. Mendeleev went on to incorporate this "correction" in his 1871 table [Mendeleev 1871], listing the atomic weight of tellurium as 125. But the "correction" is erroneous. Mendeleev was right to put tellurium in the same group with sulfur and oxygen; however, strict order of atomic weights according to the best information he had available would have required iodine (127) to come before tellurium (128). He was suspicious of this apparent inversion of atomic weight order; as it happens, the atomic weights Mendeleev had available to him agree with the currently accepted values. While his suggestion to change that of tellurium was wrong, his classification was correct and his faith in the regularity of the periodic system was only slightly misplaced. The natural order of the elements is not quite one of increasing atomic weight, but one of increasing atomic number. In 1913, a discovery by Henry Moseley made the atomic number more than simply a rank order for the elements [Moseley 1913, 1914]. The atomic number is the same as the quantity of positive charge in the nucleus of an atom. The periodic system contains a few "inversions" of atomic weight, but no inversions of atomic number. Johann Döbereiner, Poggendorf's Annalen der Physik und Chemie 15, 301-307 (1829); translated as "An Attempt to Group Elementary Substances according to Their Analogies," in Henry M. Leicester & Herbert S. Klickstein, eds., A Source Book in Chemistry, 1400-1900 (Cambridge, MA: Harvard, 1952)], pp. 268-272. Dmitrii Mendeleev, "The Periodic Law of the Chemical Elements," Journal of the Chemical Society (London) 55, 634-656 (1889); annotated text.